Harvard President Drew Faust (left) and Secretary of the Air Force Deborah Lee James celebrate the return of the Air Force ROTC program to campus with a ceremonial signing. 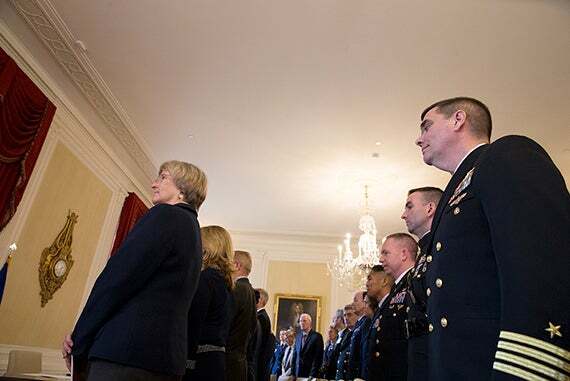 With final strokes of a pen, Harvard completed its five-year effort to restore ROTC’s presence on campus, when Harvard President Drew Faust and Air Force Secretary Deborah Lee James signed an agreement Friday establishing an Air Force Reserve Officer Training Corps program at the University. The signing, which took place during a morning ceremony at Loeb House, prompted a standing ovation from the audience, which included University and Air Force officials and dozens of ROTC cadets from Harvard and nearby colleges. The agreement completes a process that began with the return of Navy ROTC in 2011 after Congress repealed the “Don’t ask, don’t tell” policy that had banned openly gay, lesbian, or bisexual individuals from military service. 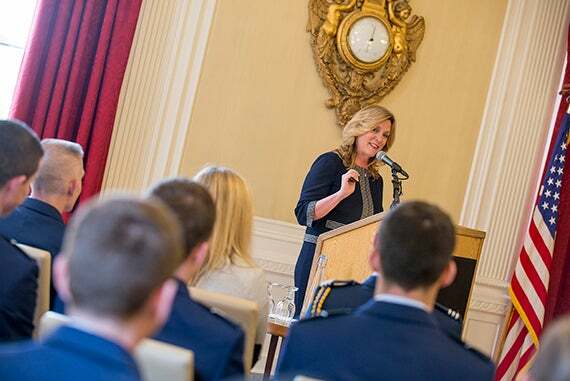 “Leveraging the best talent America has to offer is [its] secret weapon,” Air Force Secretary Deborah Lee James told students and faculty. The signing took place at Loeb House. 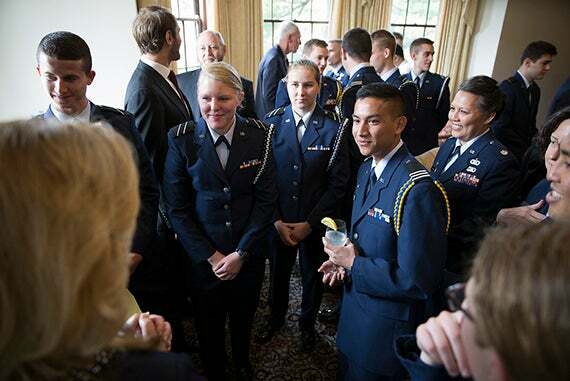 President Drew Faust (front row) was joined by Air Force officials and dozens of ROTC cadets. 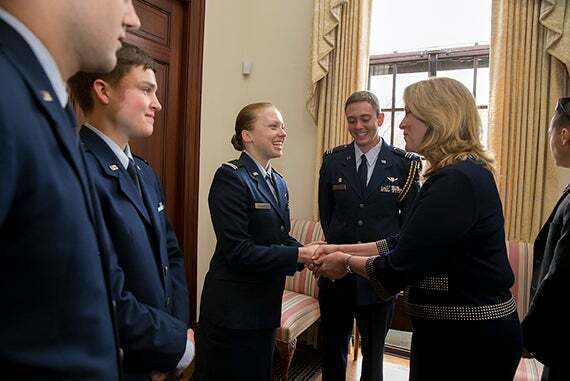 After the signing ceremony, Air Force Secretary Deborah Lee James mingled with ROTC cadets. James hailed recent policy changes that allow women to pursue any military positions for which they qualify, saying that such inclusion will give the military access to the nation’s top minds. In brief comments before the signing, Faust noted that Harvard was among the first colleges to partner with ROTC after the program’s founding 100 years ago. 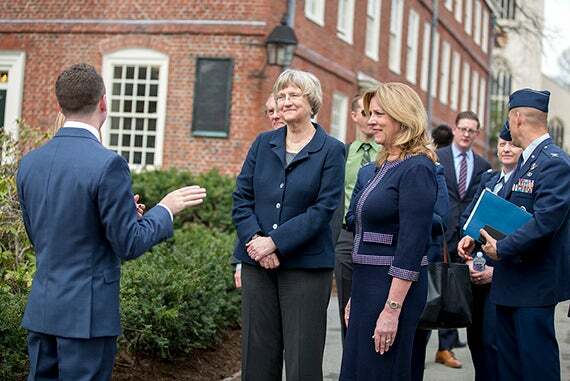 She also offered thanks to members of the Harvard community who have served in the military. James also offered her thoughts and warned today’s cadets to be ready for significant challenges in the years ahead, because the tests faced by the Air Force and the nation are increasingly complex and will demand the best of its leaders. She hailed recent policy changes that allow women to pursue any military positions for which they qualify, saying that such inclusion will give the military access to the nation’s top minds. “Leveraging the best talent America has to offer is [its] secret weapon,” James said. The agreement makes University resources available to the Air Force ROTC program in a campus setting. Air Force ROTC programs are currently run collaboratively with several other area universities at the Massachusetts Institute of Technology. In her speech, James mentioned Harvard senior Alexander Farrow, who will graduate in a few weeks with a commission as a second lieutenant. She pointed out that Farrow will be making decisions that affect the lives of troops in the field and the security of people back home. “It meant a lot to me personally,” Farrow said of the signing. “As a senior, it was something I hoped would happen before I graduated.” After Commencement, Farrow will train at Randolph Air Force Base in Texas. James also mentioned Kira Headrick, a junior Air Force ROTC cadet from Leverett House. Headrick said she’ll be able to enjoy the additional resources that the University makes available to the program next year, but added that perhaps most important is the signing’s symbolic significance. “This shows that Harvard is truly supportive of the ROTC cadets,” said Headrick, who has been accepted into a pilot training program when she graduates and hopes eventually to become an astronaut. She’ll spend this summer working on aircraft wing design at NASA. Before the signing ceremony, James took a military-focused tour of campus. Harvard’s military involvement dates back to the Revolutionary War, when George Washington’s troops were housed on campus. Harvard’s graduates — 18 of whom have earned Congressional Medals of Honor — have served in every U.S. conflict since. James’ campus tour began at Massachusetts Hall and included stops at Memorial Hall, whose walls are inscribed with the names of Harvard’s Civil War dead, and the Memorial Church, dedicated to those who died in World War I. The University started offering ROTC in 1916, but severed its ties with the programs during the controversial Vietnam War. After the signing ceremony, James mingled with ROTC cadets. She then attended a luncheon at the Harvard Kennedy School’s (HKS) Taubman Building, where she was introduced by Dean Douglas Elmendorf. Elmendorf noted that Joint Base Elmendorf-Richardson in Alaska was named after his great-uncle, who died in a test flight in 1933. During her lunchtime speech, James shared her thoughts about problem-solving, an important military skill, focusing on two cases that required “strategic problem-solving” of long-term, complex issues. What’s key, she said, is investigating the problem first, communicating effectively, implementing solutions, and following up. She used examples from the cheating scandal at the Air Force’s nuclear command, where officers falsified tests that were used to determine eligibility for promotion, and from efforts to increase diversity and inclusion in the service. In the first case, James investigated personally, talking about the situation with a range of personnel. Several reforms resulted, including eliminating high test scores from determining promotion and driving responsibility and decision-making down the chain of command. In the second case, several programs were enacted to increase the percentage of women and minority recruits, and retain them long-term. The measures included extending leave after pregnancies, instituting mid-career leave options, and starting mentorship programs. James said that in the years ahead, some of those in the audience will likely help the nation solve some of its tough challenges. She urged her listeners to be relentless in seeking solutions, but also to remember that a large part of their success will depend on the people working on those problems. “If you can get the people part of the equation right, the rest of the factors are much more likely to follow and to fall into place,” she said. Standing on the roof of Batten Hall, Julia Musso, the energy and sustainability coordinator for Harvard Business School, shows an array of 113kW solar panels that provide energy for the HBS campus. In 2015, HBS also installed solar panels on its Travis Street building and a new solar thermal unit on the roof of Esteves Hall that uses heat from the sun to provide hot water. The University’s Schools and departments have installed more than 1MW of solar panels on rooftops across Harvard’s campus, including at the Harvard Athletics Complex, Canaday Hall in Harvard Yard, the Divinity School, the Graduate School of Education, Harvard Forest, and Arnold Arboretum.